Unakoti is located 178 km from Agartala, is deservedly reputed for its 7th to 9th century stone and rock cut images, deep in the forests near Kailashahar. 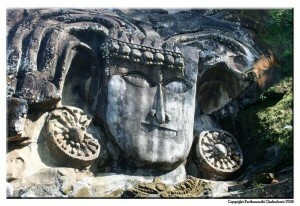 The worship of Shiv-Shakti is an old tradition in Tripura and the 30 ft. high Shiva head with an embroidered headdress, which forms part of one of the largest bas-reliefs in the country, at Unakoti, beautifully endorses this. On either side of the headdress of the central Shiva are two life-size female figures. Three enormous images of the Nandi bull lie half buried in the ground. The annual Ashokastami Mela is held here in March / April. This entry was posted in Tripura, Unakoti. Bookmark the permalink.